NLP anchoring is such a cool and simple tool. Based on the work of Nobel Prize-winning psychologist Ivan Pavlov, basic NLP anchoring is done by pairing physical touch with a feeling or behavior you want to have at your disposal. Your life has been affected by anchors, even though you may not have set them up intentionally. Have you ever put a rubber band around your wrist and snapped it each time you were tempted to do something wrong? Say you don’t want to swear anymore. Each time you swear, you snap the rubber band. Ouch! The idea is that you begin to associate swearing with the pain of the rubber band snap, which makes you not want to swear. Swear, feel pain. Swear, feel pain. This is NLP anchoring. 1. Determine how you want to feel. Say, more confident. 2. Remember a time when you felt really confident. It can be any memory when you were feeling confident, under any circumstances. You do have one! Relax and let a memory come to mind in which you naturally felt confident. 3. Choose an anchor device that involves touch, such as touching your thumb and forefinger together or making a fist. 4. Remember what you saw, heard and felt in your confident memory. You must put yourself inside the memory as if reliving it. Don’t view the memory from a distance; the feelings won’t come back. You’ve got to ‘be there’ again. Relive the memory until you begin to feel the confidence coming over you in the same way you felt it at the time. As you feel that confidence coming on, activate your anchoring device from step #3. For example, touch your thumb and forefinger together as the confident feeling increases. Release your thumb and forefinger when the feeling begins to subside. If you’ve done this well and there’s no underlying reason you shouldn’t feel more confident, this anchor set! 5. Test the anchor by touching your thumb and forefinger together in exactly the same way again and find out if you naturally access that confident state. Of course, don’t be skeptical and resist the anchor. Allow it to happen. 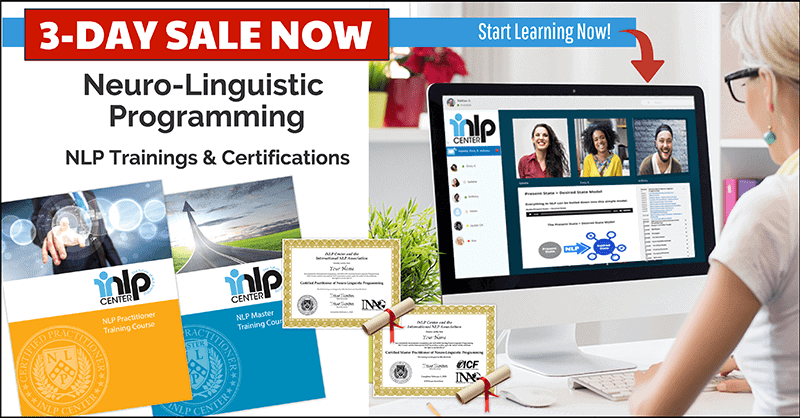 If it worked, you now have an NLP anchor! From here on out, you get to feel confident whenever you touch your thumb and forefinger together. Cool, huh? NLP anchoring won’t work under certain circumstances. Your confidence anchor may fail you in a situation in which intense fear or dread is stronger than the anchor you’ve set. Does this mean NLP anchoring is bogus? Nope. It just means that anchoring may not be a cure-all for your worst stuck states. Part of using a good tool like NLP anchoring is understanding its limitations. Take your average garden hoe. It works like a charm in soft soil with weeds that have shallow roots. Since there are lots of these kinds of weeds and soft soil is common, garden hoes are very popular. Trying to use a common garden hoe in rock hard soil with tall, deeply rooted weeds, however, is futile. NLP anchoring is no different. It will work under the right circumstances. In other circumstance, you may need to add additional tools or do other work to ‘soften the soil’.